Place the Eucharist and the Word of God as the centre of their religious life. 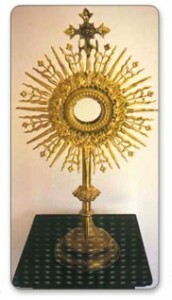 Participate in the Holy Eucharistic Celebration daily. Depend on the Lord through daily adoration to Holy Eucharist, Prayer and Meditation and Monthly Recollection. Develop faith and trust in Providential Care and Guidance. Get strengthened by the Spirit of the Lord and Blessed Virgin Mary. Lead a Life of Simplicity with Sacrifice to serve the Church and the Society.